The immigration crisis both in Europe and the United States has now reached a crescendo. Nations large and small, rich and poor are all vulnerable to the tidal waves of immigrants which wash ashore daily. Given the true level of desperation of war-torn nations around the world, who would be surprised at such a global predicament? 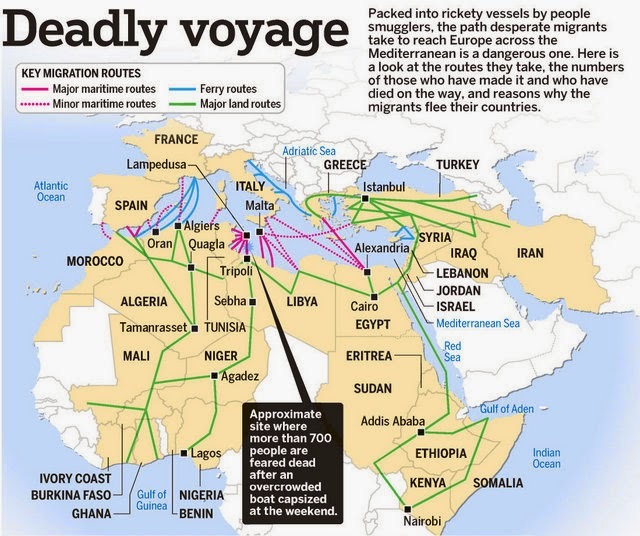 The EU has seen boatload after boatload wash ashore with their wet and weary passengers from the Middle East and North Africa. The United States of America is likewise facing unprecedented invasions of illegal aliens which occur in the wake of trainloads of human cargo being deliberately shipped to its southwestern border. In both cases — the US and the EU — war is at the root of the immigration problems. Albeit, there are different kinds of war raging on different continents and in different nations; nevertheless, it is war that is driving the indigenous peoples from their lands as never before. As the USA wages its fake War on Drugs throughout Mexico and South America, Washington also instigates and prosecutes wars across the Middle East, North Africa and the Russian border countries. We wonder why you consistently fail to mention this in your various pronouncements on the different immigration crises? Why don’t you talk about the absolute necessity of stopping all the devastating wars? That is, of course, if there is to be a durable resolution to the worldwide immigration disaster. Surely you know that Saint Francis himself would never hesitate to speak such a truth in the presence of the Pope in Rome, during his day. Knowing the horrors of war quite well from his personal experience as a soldier, Saint Francis would likely utter the unspeakable truths during his papal audience. He might even say that it is the traditionally Christian nations that are waging all the wars against defenseless and powerless peoples … everywhere. No, Saint Francis would more than likely go one step further and say that it is the historical Roman Catholic countries and other Christian nations that are stone-cold guilty of all the warmongering. We are talking about the USA, UK, Canada, Australia, France, and Germany specifically. Even Italy and Spain have participated in some of these ghastly, unprovoked wars in varying ways. Saint Francis might even go so far as to tell the pope that these unlawful and devastating wars in the Mideast and Africa are always being prosecuted by nations whose leadership is predominantly white and Christian, English-speaking and supposedly civilized. As if there is anything civilized about dropping bombs from protected cockpits high in the sky on unsuspecting dark-skinned, Muslim, Arabic-speaking people below who have offended no one. Certainly you know by now exactly why we are writing to you! While your zealous advocacy for the forced immigrants and oppressed refugees of the world is admirable, why do you not address the root cause of this rapidly escalating manmade catastrophe? Why don’t you speak to the presidents and the prime ministers of those nations which are directly responsible for the incessant war-making and unparalleled mass migration mess? Why don’t you speak to the Nobel Peace Prize winner Barack Obama, whose nation is responsible for restarting the Cold War, about his terrible civil war in the Ukraine causing thousands to flee to Russia for protection and subsistence? Why don’t you speak to U.S. Secretary of State John Kerry about negotiating a peace in Syria … in Libya … in Iraq … in Afghanistan … in Yemen … in Somalia … in Sudan …. After all, it was the USA that started each and every one of those wars, along with the UK and Israel, of course? As the senior Vatican representative in Argentina for many years you are fully aware of how the world really works. Being Jesuit-trained and schooled in the ways of Liberation Theology you obviously know that mass migrations of this nature are engineered, not spontaneous. Therefore, it is quite curious that your short-term remedy is to foist an immigrant family onto each parish in Europe. The European Union is already well beyond its breaking point, and yet this is the response from the Roman Catholic Church. Yes, the Christian nations created this social cataclysm in the first place through warmongering, but why not address the root cause of war?! Using the papal platform to merely treat the symptoms will not make this extremely serious disorder go away. The very integrity of the EU is at great risk, just as the sovereignty of the U.S. is in serious jeopardy. In fact, the immigration crisis will only exacerbate their plights since the warmongers will only feel emboldened to continue their misguided agenda. Ergo, the papacy, by its failure to confront the warmongers, risks being a part of the problem instead of the solution. 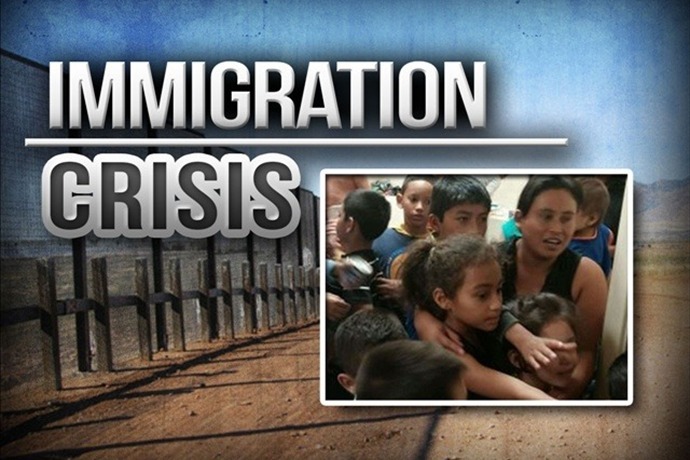 As you know, the immigration crisis in the USA is the most divisive and dire issue in that country today. Wouldn’t it be better to let the American people meet this challenge without outside interference; otherwise, unbaked recommendations from outside influences appears to be outright meddling. It is, after all, the U.S. citizenry who allowed their neglectful government to cause this ongoing calamity. It is only now that they are waking up to the fact that they are victims in a massive social engineering experiment being manipulated by hidden forces who do not have the best interests of the USA at heart. Does the Vatican really want to be implicated in such an ill-conceived plot? Just as you interceded with the ‘normalization’ of affairs between the USA and Cuba, perhaps you can do the same between Israel and Palestine. After all, the Lord Jesus Christ, who was born in that once Holy Land, would have only wanted his emissary to promote peace and love, truth and justice throughout all of Israel. This initiative alone would allow so many Palestinians, scattered across the Middle East, to finally come back home. Truly, there are so many millions of refugees displaced across the planet, only because of the cruel and barbaric acts of military aggression being directed at innocent peoples almost always by Christian nations. So many of these unjustified and unprovoked massacres are conducted by once Catholic nations with a long Judeo-Christian history up to this very day. Your Holiness, perhaps it is time for you to sit down with those heads of state and explain to them that the immigration crises they are experiencing are of their own making. Hence, the best way to fix the problem is to stop the manufactured wars and engineered conflicts, the false flag attacks and blackop assassinations. Yes? If the USA and UK, France and Germany, Italy and Spain, Canada and Australia, Israel and Saudi Arabia would only “beat their swords into plowshares, and their spears into pruning hooks”, all would be fine around the globe. Maybe you can even bring that Bible quote with you when you speak to them in their respective capitals, particularly as you meet with President Obama this month. The American president clearly could use a refresher course in Isaiah 2:4. They will beat their swords into plowshares and their spears into pruning hooks. Nation will not take up sword against nation, nor will they train for war anymore. Since you are speaking to the UN General Assembly this month, perhaps you can direct their attention to the magnificent and inspiring statue memorializing this biblical wisdom, which the members often walk past each day. P.S. May we remind you that many of these same warmongering nations were the primary participants in the great wars of the last century, as well as those of the century before. In fact, both World Wars I & II were fought by the rich and powerful Christian nations of the world. Why is that? !